In this release AS11 exposes himself both as a live and studio performer/musician and both as solo artist and as collaborator. For that reason, “Pneumatik” could be considered as a mirror to his current musical persona in full extent by reflecting his holistic attitude. In the first two pieces, “Helirohutase” and “Lydtrykkniva”, sound is provided by an electric wheel scraping a tyre. This is captured and processed in real time and the result is a mix of both the field recording of the sound of the friction and the live electronics. In the third piece, “Melutaso”, sound is also kept to the minimum, with digital frictions this time being a source of inspiration and a means to create alienated, strident layers of sound. A truly interesting work from a mature sound conceptualist. Tracks 1 & 2 were recorded live @ the 2nd Showcase of Experimental Sound, organized by [un]commonsounds @ Arteleku, San Sebastian, Spain, on 17 & 18 November 2006. Track 3 was mixed and mastered @ studio Zulo, Athens, Greece in February 2007. Track 2 is a collaboration between AS11 and Edorta Izarzugaza. When a release comprises of sounds derived by mechanic devices, it is a good thing when it doesn’t overstay its welcome. 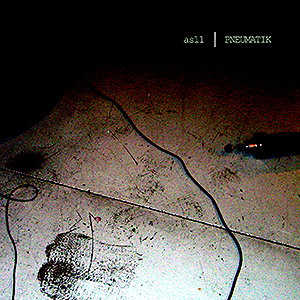 This is the case of “Pneumatik”, which lasts 34 minutes and is divided in three tracks, two of them live. The latter were recorded in San Sebastian (Spain) in 2006, all we hear having been generated by an electric wheel and a tire. I would have sworn about other sources, but that’s how the world goes (then again here’s the reason of the album’s title, I suppose). What does that approach cause? Something like a drill which, aptly amplified and in contact with another body, starts to oscillate, groan and howl. This continues in spurts, and at times is even beautiful – in the first section a mermaid seems to have entered the scene with a dissonant lamentation. The second part is slightly tamer in confront, and at one point a sort of muffled chordal sequence underlines the basic buzz. The third track, the only from a studio recording, is definitely harsher, with a ripping frequency (that one rather expects from Mattin, or akin rebels) introducing a slightly calmer, if a little hiccupping finale. Not a great album, but not bad either. Κυριολεκτεί το “Pneumatik”, καθώς οι εμπιστευτικές συνομιλίες και, ιδίως, οι νόιζ αντιφωνίες του AS11 υφαίνονται υπό την επιφάνεια της αισθητηιακής αντίληψης, σ’ένα πεδίο που η υποσυνείδητη επικοινωνία τρέφει με άμεσης κοπής υλικό. Το “Pneumatik” σαν έργο αν και αρκετά δύσκολο, δεν παύει να αποτελεί την πιο βατή αντί-δημιουργία του as11 στην έως τώρα πορεία του. Η πνευματική μας κατάνυξη ξεκινάει με τον ήχο ενός ηλεκτρικού τροχού. Επεξεργασμένος σε ζωντανό χρόνο στο 2nd Showcase of Experimental Sound το Νοέμβρη του 2006 μας μεταφέρει μία εμπειρία αναμφίβολα πνευματική! Κάποιος πιο τολμηρός θα έλεγε πως μέσα από το δίσκο καταφέρνουμε να αγγίξουμε τα όρια της εφιαλτικής παρεκτροπής! Είναι τυχαία άραγε η ανατριχίλα στο δέρμα μας; Ας αδειάσουμε τον ήχο ακόμα περισσότερο, τίποτα περιττό δε μπορεί να σταθεί στην τρίτη και τελευταία σύνθεση, πόσο μάλλον μέσα στο “Pneumatik”. I was anxious from the beginning to hear Pneumatik once I saw how it was performed. This is brilliant. A simply earthy approach using objects that are taken for granted or ignored in the mudanity of the day to day world. I prepared myself for some extreme listening assuming that the sound would push the envelope and that the philosophy itself would be the most accessible aspect of the experience. However, from the outset I was surprised and enthralled by the musicality – languid repetitions of long melodic lines – where the drill-to-tire is obviously being playing with a perspective no different than any conventional musical instrument. However, since this is definitely not conventional instrumentation, the sound also transcends familiar timbres and with the controlled hand of as11, it often seems like an aria sung by an exotic or mythical creature. Excellent for the mind and the ear. AS11 is an Athenian musician. The first two tracks are a live recording, where it seems that a drill or maybe a lathe is attacking some objects. Frequencies shift, touching wailing states while sounds float free, creating an intense, factory-like soundscape. Not really a sonic mayhem, but a soundscape with free aural spaces amidst which you can spot the individual sounds. The third track moves the whole listening experience a step further as it takes sounds of the same property and mixes – manipulates them in a nice industrial-like track. All in all a worthfull listening adventure. Music by Greek AS11 has been mostly released by Antifrost, but for his latest release he headed out to another Greek label, Echo Music. Three lengthy pieces, the first two are live pieces and one studio piece. The live pieces were recorded in San Sebastian, of which the second is a collaboration with Edorta Izarzugaza. These are the facts. The little known facts as per usual AS11 like a bit of mystification. I am not sure how to perceive the title of the release, but it seems if all three tracks use some of drill or something pneumatic like that. All three piece are highly minimal in approach with machine like sounds. Especially the two live pieces have that quality. Changes happen, but are rare. An amplified drill, with the addition of… well, of what exactly? It’s hard to tell. The third track, the studio piece ‘Melutaso’ feeds the mechanical machinery through computer effects, to the same minimal extent as the live cuts, but as the piece progresses things happen and there are major changes in the various movements of the piece. I liked that track better than the two more singleminded live pieces. They are mere documents of a live action than thoroughly composed music, me thinks.